One of the many Joys of Summer is going out for ice cream. I have such fond memories of going out for ice cream as a child. 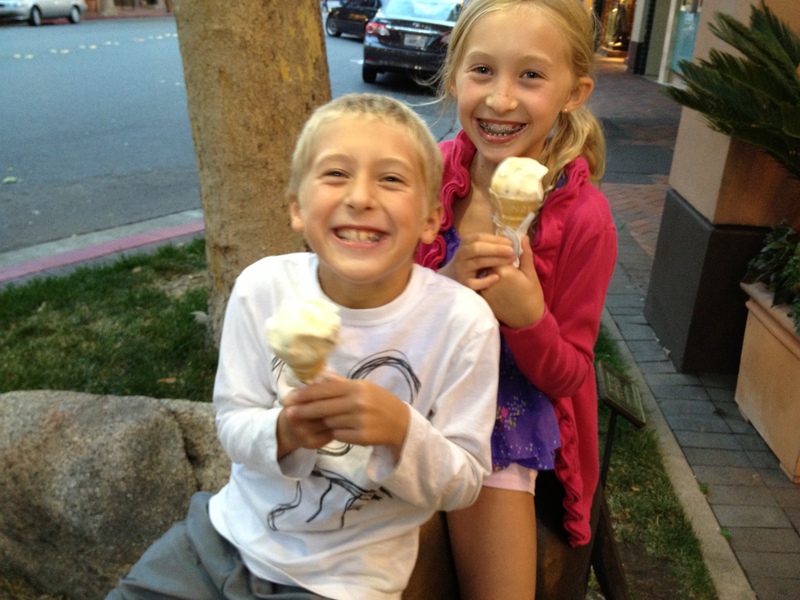 For me, going out for ice cream represents the epitome of summer: warm feelings, laughter, joy and summer fun! I do not recall, however, whether my parents or grandparents ever had to deal with sugar highs. Or whether I or one of my siblings or cousins soon became an unrecognizable and uncontrollable monster after consuming ice cream. Is it just me? Is it just my kids? Or do all children have out of control sugar highs? Are they more sensitive to the sugar than the average kid or am I more aware of the sugar high? I even take them to a Gelato place that advertises, organic and local ingredients, hoping that less chemicals will curb the out of control sugar high. So what gives? 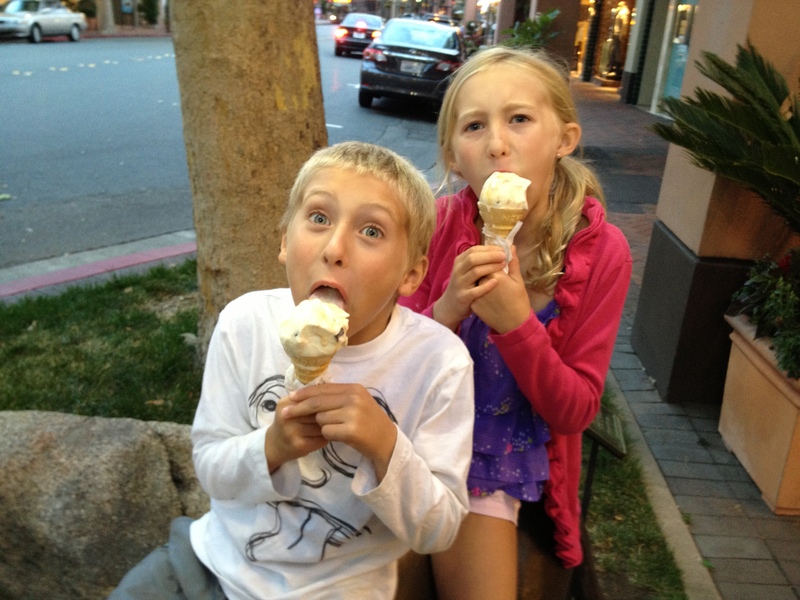 I have taken my two darling children twice in the last few weeks and both times, they had uncontrollable sugar highs. Partly because of the sugar and partly because they tend to get overly excited when we walk through downtown. The first occurrence of Sugar High happened a week or so ago, the night before we were leaving for vacation. My husband was away attending his brother’s fire academy family orientation, so I decided to make my life easier and not cook. I wanted to go to Tender Greens, my favorite restaurant, and both kids, in unison, complained about how that’s the only place I ever want to go. So, what is a mother to do? I bribed them! Or one could say, I negotiated. I said, if we could agree to go to Tender Greens with no complaints, I would then treat them to gelato. Fine, done, deal! Well, let’s just say as soon as the sugar hit their bloodstreams, all hell broke loose. They were unreasonable, hyper and generally obnoxious. They could not control their bodies or their behavior. I asked several times, to please calm down, but of course to no avail. I warned them that this would be the last ice cream excursion for sometime. Fast forward a week and 2 days (after a very fun and active vacation, a long day of travel and an all day swim meet). My mother in law offered to take the kids and I out to dinner after the long meet to celebrate my daughter’s successful singing of the National Anthem, swimming her best backstroke of the season, making it to the finals and of course because we were all utterly exhausted. (Once again, I thought taking the kids out would be easier than making dinner!) She also offered to take us out for gelato after dinner. Win, win, or so I thought! Dinner was lovely, the food was great, the kids were nice and polite, but as soon as we started to walk over to the gelateria, the kids became overly excited and on the verge of acting obnoxious. I looked at my mother-in-law and said that maybe we should forgo the gelato. I asked the kids to please behave or we would skip desert. They straightened up and we continued on to the gelateria. You were both extremely obnoxious and rude to both your grandmother and I, and I’m very hurt and embarrassed by your behavior. As a consequence there will be no desert of any kind for one week. If you sneak any kind of desert, I will add a week. I will also not be taking you out for ice cream for at least a month. Here’s the kindness part, I did not yell or lose my patience and by giving myself the time out, I was able to collect my thoughts and deliver my message in a kind manner. It was also the first time I wrote my feelings down and delivered them via email to my children. I think because of the unusual delivery, I was actually heard and it gave everyone their own time to process their feelings. I am asking the universe for Kindness and I am receiving plenty of opportunities to practice my kindness. Maybe I should ask for some money instead, Ha!